Last night, for my birthday dinner, my husband took me out to the Restaurant Blue Hilll. It is worth mentioning that in ten years of living in New York, I had somehow never been to Blue Hill, despite having been to numerous and sundry Manhattan restaurants in all price ranges. After having the food and wine tasting menu at Blue Hill, I would rate it among the top 5 New York restaurants. The Chef at Blue Hill incorporates my favorite type of cuisine and cooking techniques into his ingredients. He uses all fresh, organic, farm-grown ingredients. As noted on their website, Blue Hill takes the motto "great cooking starts with great ingredients" seriously, as the majority of the ingredients used in the dishes served at the restaurant come from Blue Hill's own farms, in Great Barrington, MA and just outside of NYC at Stone Barns. In fact, Blue Hill has a second restaurant, Blue Hill at Stone Barns in Pocantico, New York, on the Stone Barns Property. Although quite expensive, I have heard stellar reviews from my foodie friends who have dined at Stone Barns. In addition, if you go in the spring, summer or fall, you can take a full tour of the property, including greenhouses, gardens and livestock. I have heard that it is a lovely day experience, which I hope to try in the spring. Upon arrival at the Manhattan Blue Hill, we were quickly seated by a friendly server with a wonderful Australian accent. Shortly thereafter, we received two glasses of champagne to celebrate my birthday as a surprise gift from two very thoughtful, wonderful friends of mine from college. I am actually not sure which champagne it was off of the wine list, but it was very enjoyable and a great birthday surprise. At this point, we decided to leave our experience in the Chef's hands and try both the food and wine tasting menus. First, they brought out various artfully presented fresh vegetables - radishes and broccoli. They were crunch, organic and tasty (even though I have never loved radishes). Next they brought two delicious creations that looked like mini-hamburgers. These were, in fact warm mini-burgers made with beets and goat cheese, one of my favorite food combinations of all time. Knowing that my husband would refuse to eat this if he knew it was beets (which he claims to hate even though he has no idea how much he would love them if they were prepared in an interesting way), I didn't tell him what it was and urged him to try it. He did, and of course, he loved it. We enjoyed it so much that our wonderful waitress actually brought us seconds, which were devoured instantly by myself and my new beet-fan husband. Next, our waitress brought us our first glass of wine, a 2007 Mayacamas Sauvignon Blanc from my favorite place in the United States (as you must know by now if you have been reading my posts regularly), Napa Valley, California. I love Napa Sauvignon Blancs – I personally prefer them to New Zealand Sauvignon Blancs, which are generally much more acidic. 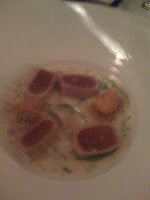 The one that we were served was fantastic and paired nicely with the local big eye tuna course that was soon to follow. Once the wine was poured, we were served a variety of homemade butters and spreads with bread, which we enjoyed, followed by a small meat course. We enjoyed the rest of the wine with the local big eye tuna course that I mentioned before, which was prepared New England style with Maine shellfish (tasted like scallops). It was mouth watering delicious. The next wine that arrived was the 2006 Emmanuel Giboulet Bourgogne Blanc, from France, which was another wonderful wine. This wine was paired with Blue Hill’s version of mushroom risotto. I enjoyed this, since we had just made our own mushroom risotto the night before. This risotto used various types of organic mushrooms (I think I tasted chanterelles and shitakes), creamy rice, braised cipollini onions and chicory root. Most wonderfully, the risotto was seasoned with star anise, one of my favorite spices, which made the flavor combination complete. Next time I make my own mushroom risotto, I will be sure to include star anise. Our next course was a rare veal which was known at Blue Hill as “Rabbi Bob’s Veal.” Out of curiosity, I asked who Rabbi Bob, the dish’s namesake, was. Our waitress told us that Rabbi Bob is apparently a supplier of quality kosher meats to a variety of restaurants in New York, and that he is actually non a Rabbi at all, but is quite scholarly looking, complete with a white beard. His veal was delicious, although a bit on the rare side. However, we enjoyed the course, nicely served with chestnuts, cranberries and brussels sprouts, all of which added a very seasonal flavor to the dish. It was paired with a Malbec Wine from Napa Valley, called Pax Americana, which we enjoyed (I like the less tannic red wines like Sangiovese, Pinot Noir and Malbec, and tend to stay away from Merlot and Cabernet Sauvignon). 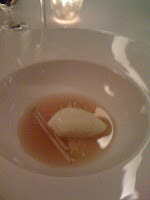 Our next course was a green apple sorbet which was served in a lemon thyme soup. I have long been a fan of green apple sorbet and this one was no exception. It was actually one of my favorites because it was made with Honeycrisp apples (which are actually a combination of green and red in color when I buy them at the local farmer’s market in Park Slope), my favorite type of apple. I have actually developed my own recipe for apple sorbet that I hope to test out this weekend, so stay tuned. Blue Hill’s sorbet was refreshing and delicious and the thyme-lemon soup that it was served in had a very apple cider kind of flavor to it that enhanced the sorbet. Finally, it was time for dessert, which was a course of poached quince with caramelized white chocolate and lemon sponge cake with fromage blanc sorbet. This was amazing and might have been my husband’s favorite dish of the night. Who says you need to eat chocolate cake all the time? I love quince when prepared properly, and actually just found the perfect organic market here in Park Slope near our condo where I was able to buy some. 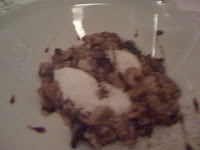 It was delicious as part of the desert and paired nicely with the Albert Seltz Sylvander dessert wine from Alsace. It is an expensive meal at a nice restaurant, but well worth it. 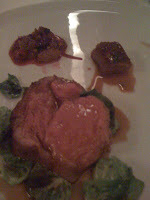 This restaurant review is one of the first for this site, and will be an occasional (perhaps monthly) feature on http://www.akitcheninbrooklyn.com since a wonderful dining out experience can often serve as an inspiration for our own culinary adventures.